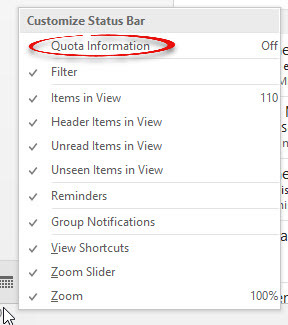 How to display quota information in Outlook. This will allow you to see when your mailbox is getting full. This article also has links to ways to clear your mailbox. 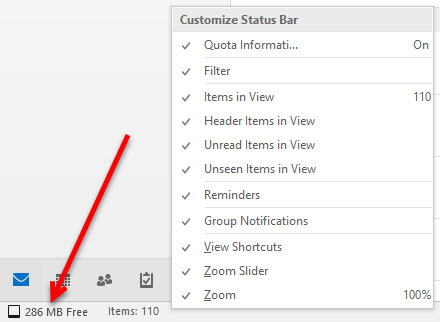 Step 1:Right click on the bottom status bar in Outlook and click Quota Information. Note the quota listed in the bottom left of the task bar. Quota information can also be found by clicking File, then Info. Under Mailbox Cleanup, it will tell you exactly how much space is available out of the total amount of space. 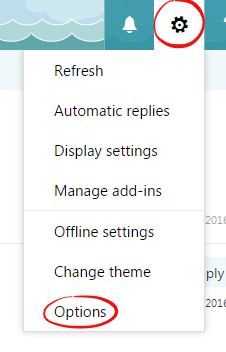 Step 1:Log on to your mail in OWA (Outlook Web App) at http://mail.etown.edu/Step 2:In your OWA inbox, click the gear in the top right corner then select Option. 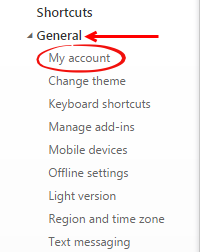 Step 3:Expand General and select My account. Step 3: Your mailbox usage will be displayed at the bottom. Take action to reduce mailbox size to avoid reaching the quota. If you reach your quota you will not be able to receive any emails. Save file attachments outside your mailbox . For example, to your computer or a memory stick.